Watch for a great sale and seasonal or clearance discounts. Find a coupon code & if necessary add a filler item to reach the requirements (free shipping, 10% off, $10 off a $25 purchase, etc.). Use a cash back site like EBates that will give you a percentage of your purchase price back! 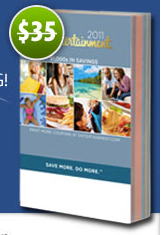 One current example of how this can really work to put money back in your pocket is on the Entertainment Book. 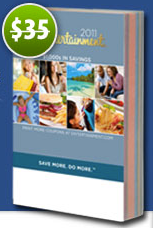 This is a huge book of coupons for local restaurants and stores. It normally costs around $20 on sale, but right now its on sale for $8.99 with free shipping! The cashback puts this deal over the edge with 17.5% back from EBates! It’ll be $7.42 for a huge book of discounts when all is said and done. Not only does EBates give you cash back on everyday online purchases, they are also giving one lucky Southern Savers reader a $100 bill! To enter the giveaway tell us your tip for online shopping, or the best deal you’ve gotten. Like Southern Savers and eBates on Facebook and leave a comment that you did. Shop through ebates and get some of your money back and use as many discount codes from southernsavers.com as possible. I always check retailmenot.com for discount codes before ordering online. Also, ALWAYS go through ebates! I once purchased a huge case of organic Pasta sauce on Kmart.com for super cheap. I think paid about .50 a jar. Retailmenot.com has the best coupon codes. They are usually current and a lot of online retailers are available! My best advice for online shopping is to sign up for loylalty programs and wait for sales to redeem the rewards. For instance, as a member of My Coke Rewards, I often earn Shoebuy.com certificates. Shoebuy.com has great discount sales from time to time, a combining a shoebuypromo with the coke rewards certificates allowed me to buy a pair of New Balance “Shape Up “shoes for $15 shipped! It also allowed me to get a great pair o fleece lined crocs for my Dad for $5 shipped! My best tip for online shopping is to check SoutherSavers.com to see what kind of deals are posted and go to retailmenot.com for coupon codes. i only buy items already on sale, plus free shipping, and ideally an additional savings (% off or something similar). One of my best deals was some luxurious lavender bath scrubs for 1 penny at drugstore.com. They made great Christmas gifts! The best deal I have found is going through ebates to purchase magazines through Magazines.com. One magazine I get costs $15.00 per edition… not a bad deal to get 4 of them for the price of two with the ebates deal! Add in the benefit that it’s mailed directly to me and I’ve saved gas on top of that. When I shop online, I first check http://www.retailmenot.com to see if there are any coupon codes. I then go through ebates during sale times to triple up on discounts! I order my diapers on amazon.com using subscribe and save and it is SO much cheaper!! I got 50% back on Magazines.com. My online shopping tip is that I usually head over to retailmenot.com to see if there are any online coupon codes to use. I signed up on Ebates when Magazines.com was the daily double. It went from 26% back to 51%. I bought a $50 gift card to Magazines.com, got $25.50 from ebates, and got several subscriptions to All You magazine. I use mypoints.com for most of my online shopping. I can earn points for my purchases, and can often double (or even triple) dip by using various other savings outlets. For example, I’m a Priority Rewards member, and can accumulate points for my hotel bookings through both MyPoints and PR, and if I use a point earing credit card, I get points for my purchase! I always use ebates and check retailmenot.com for coupon codes. The best deal that I have gotten using Ebates was ordering three magazine subscriptions through Magazines.com and I got 51% back through Ebates! I liked southernsavers.com and Ebates! One time I was able to get a couple shirts from Gap for a few dollars each combining a few deals with my reward dollars! Liked Southern Savers & Ebates. iv liked both ebates and southernsavers.com today. I hope to start saving!! I ALWAYS find discount codes, wait for free shipping deals, and use Ebates when shopping online. I have gotten tons of great deals with that combination :) And, of course, I like Southern Savers and Ebates on Facebook! I liked both on my facebook page. Like both sites on FB. I love getting huge discounts on my family's clothes at the end of the season and/or after the holidays,when clothes are deeply discounted, and then we have great new clothes for next year! I also go through ebates for extra discounts! I like Southern Savers and Ebates on FB! I always google free shipping codes/promo codes before purchasing. I've been using ebates for a few months now and love the additional savings. I like both pages on fb, too, for up to date promos! Definitely avoid shipping costs, if possible. Even on Amazon, there are multiple listings for some items, some with free shipping and some not. I like Southernsavers and Ebates on my facebook! I liked ebates on FB! and Southern Savers! Not an avid online shopper but I try my best to search coupon codes. I like to sign up at a website before shopping and waiting to see if they send me coupon codes. I liked Ebates ND ss ON fACEBOOK! Ebates and Amazon are great! My tip for online shopping is always search for discount codes before you buy anything. I almost always find a coupon code for a percentage off. I liked Southern savers and Ebates on FB! I got an entertainment book about two months ago, that was the best deal I have gotten using Ebates! Thanks! I have already liked southern savers on facebook and just liked ebates too! The best deal is to obviously use ebates (no joke, I get so much money back) but to also make sure you always get free shipping! There are codes to be found! I avoid shipping and try to have the item marked down. Our wedding photographer gave us a disc of all our photos instead of prints, so that we could print whatever we wanted, when we want to. I found some great deals on SouthernSavers, and I have not paid a single cent to have any of our wedding photos printed, but I have an album full of pictures, plus framed photos & collages decorating our house! So far, I haven't even had to pay shipping on anything! That's my kind of deal! i like ebates on facebook. I went through Ebates on July 4th to the Reebok online store. There was a pair of running shoes that had been discounted $20.00, an additional 30% off for a July 4th sale, and then 9% cash back from Ebates. I have told everyone I know about Southern Savers and Ebates!!!! Both wonderful sites and I have saved quite a bit of money. Even did the Entertainment book deal back in May! And I “liked” both SS and Ebates on facebook. My best tip for shopping online is to search for the best deals. I can usually save by investing just a few minutes to price compare. Your site is wonderful because you spend a great deal of time doing all that for us. Love Southern Savers. Love Ebates. My tip is to buy when you see a great deal- even if it's July and you need a Christmas present. I ALWAYS search for coupon codes before ANY online purchase… I just go to Yahoo and search “store/website coupon codes.” I will usually only buy things if I can get free shipping (no minimum $ amount) and a percentage off. Sometimes I will go to slickdeals.com and search “free shipping.” I will choose where I online shop based on who is offering free shipping. I also always use Ebates to get a little extra cash back on whatever I am buying! I actually used Ebates to get my All You magazine for $10 for a year subscription! Online shopping tip: Always google for coupon codes! My tip for shopping online is to google coupon codes for the website before you check out. You never know when coupon cabin or retail me not will have a % off or free shipping code unless you check! I like Ebates and Southern Savers on Facebook. Always check for coupons and free shipping before purchasing. If its your first time ordering from the company, don't be afraid to ask for courtesy free shipping to try their products. I don’t buy anything online without first checking evreward.com (tells percentage cash back from various shopping-rewards sites — ebates one of the best among them — and lists promo codes), retailmenot.com (promo codes) and buxr.com (member-submitted promo codes and deals). My tip is to use price aggregate engines online like Google Shopping and PriceGrabber. My best deal was saving 100% on a Groupon certificate yesterday for GNC vitamins – got $40 worth of products for FREE using my Groupon discount code ($20 off my first Groupon purchase – the cert was $19 for $40 worth of products). I've recently saved 50% on truck audio parts online, 30% on truck speakers, and 80% on another truck accessory. A few months ago I saved 50% on a brand-new Whirlpool front-load washer and dryer set (normally $2000 before tax and delivery and I got it for $1300 total – including tax, delivery, and installation). I am a Facebook fan of both SouthernSavers and Ebates! Hope I win! I use the site retailmenot to get coupon codes before I shop online. I'd love to win. My tip is to follow the retailers on twitter because they usually tweet the good deals! My tip is to use google shopping to find the best price. Then go through ebates to get the discount. I like both southern savers and ebates on facebook! My tip for shopping online is to make sure the website you're using is completely secure. I liked SS and ebates on facebook. I “like” both Southern Savers and Ebates on Facebook. My best deal has been on clothes – shopping at “onestopplus”. com for plus size clothes. There is ALWAYS a discount code to be found online, somewhere. I usually save 30-40% just by searching for a code. And they're accessible through Ebates, so it makes plus size clothes AFFORDABLE! I love all the great deals I've gotten on magazine subscriptions through ebates! I always search for a free shipping code before I buy anything online. I like Southern Savers on Facebook. I also search for various discounts code online before checking out and paying the full price! The best online shopping deal that I've gotten has been on cricuit cartridges. They were on sale for $17.69 and some of them retailed for over $55. I like Southernsavers and Ebates on facebook!!! always seem to save the most by shopping kohls clearance through ebates! I liked both of you! I always subscribe to the website email if possible and they send coupons, or search for coupon codes. Always, always, always look for coupon or promo codes. They are easy to find and cut money off your overall bill almost every time. Love southernsavers and ebates on facebook! My best deal was David's cookies which i got father's day this year! Of course, I like southern savers! I like ss on fb! I like ebates as well as southern savers. I have gotten great deals on line buying baby food/snacks by the case and using coupon codes. Amazon is a great site to use to save money on everyday baby items! My best ebates deal was on a huge lego kit for my son from lego. I checked “like”, but I am lovin' southern savers and ebates! I like Southern Savers and Ebates on Facebook. Southern Savers helps keep me on track for savings. She always has the best reminders. She reminds me to go through e-bates to save even more, which I have done several times. Extra savings is definitely what I'm into!! The best deal I ever got online was, when I got my Husband, Father-In-Law, and Son all RX Crocs for $12.00 shipped with an online coupons code! Liked ebates and southern savers! Love saving money with both! I “liked” Southern Savers and Ebates on Facebook – and I like them off of FB also! When shopping online I always look for the best price of course, then I look for other discounts that can be added to that. I once was able to get a $60 set of blocks for my child for $8.00!!! Now that I have found Southern Savers and Ebates I hope to increase my savings exponentially! Thanks Southern Savers and Ebates!!!! I think my best online deal was painting supplies at 75% off. My tip for online shopping is….”Jenny knows best”. I liked SS & ebates on fb! I shop through Amazon as much as possible b/c of free shipping! I always use ebates when shopping online! Also, my credit card gives cash back as well, so WIN WIN!! My best deal was the myhabit website. Got a bathing suit for $4! I liked them both (and like them in real life, too!). I shopped from the comfort of my favorite armchair last Black Friday and got some great deals from Kohl's through Ebates. A recent great deal is a pair of LLBean jeans for myself for $10, with free shipping. I went through Ebates, so it was a great deal on a great product! I thought I already liked both SS and Ebates on FB. Apparently not. I do now! The best deal I ever received with online shopping was through purchasing a coupon code on ebay for $4 that saved me $59! Around Christmas this past year, I was able to use Ebates at Kohl's and got 8 large bath towels, 3 toys, a couple of outfits for my 1-year-old niece, and a robe for my mom all for about $75 out of pocket, then I got back about $5. Not bad for a good chunk of my Christmas shopping! Thanks for the giveaway! I liked Southern Savers and Ebates on facebook! Liked Southern Savers and ebates. Have actually loved both for a LONG time! I'm also a fan of Southern Savers on Facebook! I like SS on FB. One of the things I do with Entertainment books is sell the offers I will not use. For instance: Last time I sold the series of offers for discounts to golf courses on Ebay. Sold $100+ of coupons for $20, it paid for my book plus overage. HeHe! My husband finally admits that I'm a useful deal shopper. I got the BEST deal by shopping for a used car online. I finally saw one that met our criteria and price and printed off the 'fact sheet' – when we got to the store the price on the car was $2,300 MORE than my interne printout. I was a clerical error – they had entered in the price they PAID for the car not the ACTUAL RETAIL – but they honored the price until midnight of that night – needless to say we bought the car and saved $2,300!!! I love Ebates and ALWAYS use it when online shopping! Thank you for everything you do on Southern Savers- it's a tremendously helpful tool! My favorite tip for online shopping is to buy a Groupon savings like a $30 voucher for $15 and then wait for the site you are buying from to do free shipping, 30% off or more and then score huge savings by combining all your discounts!! I just recently started using ebates and like both you and them on FB! I love using my kohls cash combined with codes I get in the mail to score super cheap clothes for my son for the next year… sure I have to guess on sizes but its totally worth the savings! I love using Ebates to save money! I “liked” ebates on fb. My Lands End bathing suit I got through here!! My tips for online shopping… I try not to buy online unless I have a coupon code, whether its for a computer part, or dominos pizza. I follow southern savers on fb. I like to shop landsend with coupons on out of season sale items. I always look for discount codes while shopping online. I like southernsaver and ebates on facebook. Like Southern Savers and Ebates on Facebook! I am always looking for free shipping online. I use both the book and Ebates. I had my last Ebates rebate direct deposited in my Paypal account and used it to pay for the last thing (books) I ordered through Ebates. So, I got cash back from purchases that helped pay for a purchase that has also earned me cash back. I love it! Oh, and obviously I am a fan of both FB pages. Best tip: at the grocery store, sale + coupon. And stick to the list! Impulse buys add $. Have liked both. Online tip: search for coupon codes first! Like Southern Savers & Ebates on FB- Kimberly F.
I like southern savers and ebates of facebook. I always search for coupon codes, any suggestions on the best site for reliable coupon codes. I also purchase things on sale and do the filler items when necessary. Right now all of these daily shopping deal websites have saved me tons of $$ and I have gotten things for free for just signing up or referring a friend. Thanks to ebates and southern savers for helping me be a better steward of money! I like Ebates and of course, Southern Savers! I ALWAYS search for coupon codes before checking out. The hubs even does it now too! wait for a sale and use ebates! I've been a member of ebates since 1996. Always check there before making any purchases online. Over the years, I've earned hundreds. I like Ebates & Southernsavers on facebook. I always use ebates when I shop online! Always do a web search for coupon codes for online purchases. Just shopped at the Disney Store online last week when they had free shipping (found out through SS) and got both stuffed OSO doll and stuffed Daisy doll for my daughter for only $10 each. Great deal! Plus, of course, went through Ebates too! I am a huge clearance shopper and like to combine it with free shipping codes! My tip for online shopping is: I use ebay a lot. It's kinda like thrift store shopping. I don't like to buy things new because I have a 1 yr old who just destroys it anyway. I like the Amazon diaper coupon codes that come in magazines sometimes. I got my sister two huge boxes of diapers for less than $10! Wait for more than one of the coupons and stack them, as long as they're different. I like Southern Savers on Facebook. I check Ebates before buying from a website. I always use ebates and check retailmenot for coupon codes. I liked ebates on facebook. I always google the store name and coupon code to see if there are any coupons out there. I also always check ebates or swagbucks to see if I can get any extra savings! I like SS and Ebates on Facebook! The best online deal I have gotten was not really a deal it was actually a reward for using Ebates. I recieved a big fat $100 check from Ebates for having my taxes done at H&R Block(something I do every year anyway). LOVE Ebates! I ALWAYS look for free shipping or %off codes, and I always go through ebates! LOVE the big fat check! I guess my best tip is to not get carried away by sales and deal and end up spending more than you would have otherwise. Only buy what you need and always know what you need so that you an get it for a good price when it goes on sale. I like SS & Ebates on FB. I always use Ebates too. And I always look for coupons. I usually get free shipping and a percentage off my order! The best deal I've got online is when Jenny announced the sale for Crocs with free shipping! I got my nephew a pair for $9.99 and my daughter a pair for $8!!! I like Ebates and Southernsavers!!! I shop sales that include lots of items for one low price, I google for coupon codes, and I shop through Ebates. Saved $150 and paid $95 for brand name clothes recently! I've liked them both. Please enter me. My tip I use always- is to look for codes for % off on anything buy. I like SS and Ebates. I got a pair of pants from an Old Navy Outlet for 99cents. I liked both and I ALWAYS try to get free shipping. Shipping is outrageous and if it's too expensive I never buy the item. Like Ebates and Southern Savers. Love Ebates…been using them for a while!!! I've liked both Ebates and Southern Savers on facebook. Love ya both!!!! I use ebates everytime I shop online! I was using it for eBay. So upset eBay is on Ebates hiatus!!! Two of my favorite sites! I “like” SouthernSavers and Ebates. Make that LOVE! I double dip by using ebates and paying with a credit card that earns rewards. So far I have enough reward points to pay for Christmas gifts for my parents & in-laws. Wow, too much shopping I guess. Already like both Southern Savers & Ebates on facebook! I like both Ebates and Southernsavers on FB. I shop online with discounts and ebates, but I also like to buy items or sign up on a website that gives you a discount on future purchases for buying from them the 1st time. I like SS and Ebates!! I made a copy of my first Ebates check to show everyone because it was just so hard to believe that I actually got paid to shop online. My tip is to never pay full price, everything will eventually go on sale. Be patient. I get the very best deals by signing up for emails. Any company that I shop from regularly, I sign up to receive thier emails. I get exclusive coupons and sometimes early invites to sales that way. Then I naturally go through EBates to start my shopping. I am a fan of Southern Savers & Ebates on Facebook. I like Ebates & Southern Savers!!!!! My tip is to check Southern savers often because Jenny gives you all the latest so of course I like SS and ebates! I always check to make sure there are coupon codes available. I also check out Southern Savers to make sure there isn't some deal I haven't heard of…I always shop through ebates when making online purchases. I like Ss and ebates on FB. I love using cash back sites! Just bought a rug for the nursery and saved $70 and got free shipping! Always check if there are any coupon codes available to further expand on your savings. I love using Ebates. I got my son a pair of Croc sandals for under 11 dollars WITH shipping one day thanks to this site + ebates. I am a fan of Southern Savers and Ebates! I “Liked” both Southern Savers & Ebates. The best online deal Ive gotten was from nomorerack.com they have daily deals and give you $5 when you sign up and shipping is $2. I got a rockin pair of boots for something crazy like $12 total!! One of my favorite, reoccurring deals is being able to buy a subscription to Cook’s Country magazine (and other magazines for gifts) through magazines.com when the site offers a $5 off code and Ebates offers 52% back. Such a treat! I also use ebates.com and retailmenot.com. Between those two, you always end up saving! Don’t just go through one cashback site. Be sure to check EVrewards.com before you order through any of them. They tell which gives one will give you the most back. It’s invaluable. I try to wait for a daily double promotion from ebates. I was so excited to get such a great deal from magazines.com when they were offering 51% cashback. I am always looking for the best deals on children's clothing. I found with all the deals going on a pair of Nike flip flops for my daughter, normally $23 and with shipping only paid $6 and earned 3% cash back! I already like Southern Savers and went in to Facebook and added Ebates! Love it when I get a check back in the mail for shopping! tip…always go through shopathome.com or ebates before you make a purchase! thanks for the giveaway! I like Southern Savers and Ebates!! Love finding a deal! I always check for promotion codes before I purchase anything online. I also subscripe to an email list for my favorite companies so I will know when they have their best sales. I also use Ebates and I love getting that check in the mail. I always check southern savers and ebates before shopping online. I got 5 items for myself from old navy and paid $13! I liked Ebates and Eversave on Facebook! Best way to save is to always price check the item you want before you go out to buy! Sites like yours is a HUGE time savor and big help. If I need to buy a big ticket item, I'll put it on a price watch site, like Pricespider. These sites email you when your item goes on sale anywhere online! A recent deal I got through Ebates was a pair of Crocs for $7.99! Love a bargain! I liked both. My best online tip is to find the electronics or household goods I want, find out their price, and then use eBay or Amazon Marketplace to get them used for a fraction of the price! I sign up for emails from the merchants. They usually send out emails for coupons and free shipping that you normally wouldn't know about by just visitng their website. Ebates is the best tip for online shopping! I like Southern Savers on FB! I like Ebates on FB! I like both of you!!! I have found that the best way to get a good deal online is to look everyday, sometimes several times a day! First, I check Southern Savers for already scoped out deals of the day, then I check my email for free shipping offers from stores that I have purchased from in the past, next when I'm ready to order I go through Ebates…. I like Southern Savers and Ebates! There should be a Love button!!! I love both ebates and southernavers!! I always google the site for any coupons to use and never buy an item unless it's on clearance. love shopping on-line. always find it easy, fast and convenient. southern savers helps me so much since my lay-off. I like SouthernSavers on FB. My tip for online shopping is to never pay for shipping, this adds so much to the bottom line. I liked SS and Ebates on FB! I love earning Swagbucks and redeeming them for Amazon gift cards. Perfect for when the birthdays roll around!! I always check Ebates first! And RetailMeNot for codes. I always check for online coupon codes and go through ebates or shop at home. Don't these coupons usually expire around November of each year? To save the most money, I always go through Ebates and always check RetailMeNot for discount codes. I use the internet to make sure I'm making the best purchase possible by looking up reviews on consumer websites and Amazon. It's not a good deal if it's a poor product that will break in 2 weeks! I love southernsavers and ebates. I actually found out about ebates on southernsaver and it has and is going to save me alot of money. And of course I like them both on Facebook. I always use ebates, I love it when they have coupon codes to go along with the cashback. I also liked Facebook for Souther Savers and Ebates! Tip: Go through ebates.com or fatwallet.com to find deals. I would have to say that Ebates is my best online shopping tip….saves lots of money going that way. To make Christmas shopping a little more manageable (and cheaper!) I subscribe to every retailer's newsletter. They'll send you emails when their Clearance items are at rock bottom. That's when I take advantage of the steps listed above to stock up on gifts. Did the liking on Facebook! I love ebates. My best deal was the 51% cash back at magazines.com. I got the highlights for 2 years and after ebates it was about 30 dollars-maybe less- for 2 years which does not seem like a good deal but I have never found it any cheaper anywhere else. I 'like' SS and ebates on FB. I liked SS and Ebates of FB!! I “Liked” both Southern Savers and Ebates on Facebook. I also use ebates when booking hotel reservations online with choicehotels.com I love the choice privledges reward program, and there is always a choice branded hotel near where we are traveling to. Great to get a rebate from ebates too!! Thanks! I actually made moohlah on that deal…oooh, shivers…. The best deal was when I bought two books that would have cost $50 had I bought them at the bookstore. I paid $3.99. Liked ebates on FB. Also, I used to love it when diapers.com was on ebates. I'd mail in coupons and last fall, they ran a 30% credit towards your next purchase. Plus, you could add in Pampers Gifts to Grow discounts. They also do free shipping and you can use soap.com Groupon codes – it made for great diaper deals! I went through Ebates to order from Omaha Steaks and got a lot of meat for a $1.16 a pound! And it was delicious! I always look for discount codes/coupon codes before I shop online. And I look at multiple sites to get the best prices. The best tip for shopping online is use Ebates for cash back (duh!) and buy items only when free shipping is offered! My best tip is to always check for discount codes on retail me not. I always check for coupons codes before shopping online, and of course, I use Ebates to get cash back! I like SS and Ebates on Facebook. The best deal I got was on a TV. I bought it thru amazon and paid almost $300 less than anywhere else! Probably one of the best deals I've gotten this year on-line has been 3 short-sleeve polo shirts I got for my husband from Lands' End! The total was around $15 w/ free shipping. It was amazing to get this price at the beginning of spring when we needed the shirts as opposed to an end-of-summer sale. I'm really starting to like groupon –thanks to Jenny! I am really hooked on living social, eversave, and groupon! I also like southern savers and ebates on facebook! I love using Groupon and Living Social, you can get great deals that way! I also liked SS and Ebates on FB! I don't just like Southern Savers and Ebates, I love them! I go through ebates to book our hotels and airline tickets, as well as everything else possible! But I've seen the greatest rebates with our travel purchases! Woo hoo!! my tip is to go through ebates when possible, shop when they have some good deals, i have a coupon and/or free shipping. i always google for these if i don't have them. i was just told at children's place that every time i enter my email in their machine at the store i will get better deals sent to me, don't know if it is true but she said the more you enter it, the better the deal will be. I liked both on my FB page. Not sure why I never “liked” SS though…..I LOVELOVE SS!!! I lke you both on FB. My best online deals come from coupon bloggers such as SS. I could never find such deals on my own. The best deal I have gotten was from the NBA Store for my 14 year old. I ordered a Kobe Bryant t-shirt and sweatshirt for almost $43 before shipping and only paid around $10 OOP. I liked SS and Ebates on Facebook! Thanks! The best deal that I have gotten online was a new book that I got for 95% off plus free shipping! The best online purchase ive gotten was a gift for my husband. I like both Southern Savers and Ebates on FB. The best deal I got is on Woot. My husband and I love this site for great deals on Electronics. I like Southern Savers and Ebates on fb. In fact, I LOVE both of you!!! Put a sticky note on your computer to remind you to ALWAYS check if Ebates is partnered with the online store before you shop and then refer your friends to save the most money!!! like you both on facebook!!! I use ebates every time i even think abotu shopping for something online. Last week i used them when i purchased my airline ticket!! every little bit adds up!! Ive had you on facebook for a couple weeks now bc I love your site so much. I visit it 3/4 times a day. Before my online shopping begins I start at retailmenot.come and check out any codes coupons etc then ebates and from that point I just start find the best bang for my buck. I love the daily deals, and my favorite online deals are thru living social…love it when the movie tickets are BOGO!! I “liked” SS and ebates on FB!! Depending on what I'm looking for, I mainly stick with Amazon or Ebay for the bulk of my deals. The free shipping combined with my swagbuck gift cards have me ordering pretty often on Amazon. I have liked SS and Ebates. I loke SouthernSavers and Ebates A LOT on here, and on Facebook! Thanks Jenny! I check for any discount codes/coupons, then I go thru ebates to get the best bang for my buck. My tip is to take time. Sometimes something seems like a great deal, but take some time to sit back and think if the purchase is really necessary. You're not saving money if it's not. My best deal so far was a $104 bill at Harris Teeter down to $37! Thanks Southern Savers! Always check sites like ebates or dealhunting to see if there are any coupon/promotion codes you can use on your purchase! My children take Coromega Fish Oil Supplements. I only buy it online at Walgreens when they are running the Buy 1 Get 1 Free Sale. I save alot of money buying it online versus a local health food store. Liked Southern Savers and Ebates. I started using ebates about 18 months and now I don't anything online without going through their website! I love my checks in the mail every quarter! I always check for online coupons and then go through ebates. Get a coupon code then go through Ebates! Made over $400 so far! Likes them both! ALways check Southernsavers for what I am looking for then go through ebates to increase my savings. I like both Southernsavers and ebates on facebook! Def always search for coupon codes & use sites like ebates or upromise to get extra credit for spending online. My best deals online combine free gift card deals from Publix & then looking for clearance items paired with online coupon codes. I got a wonderful deal from gap.com this year doing that! I always search for free shipping codes and discounts and always use Ebates or ShopAtHome for online purchases, even Groupon! The best deals I have received are with sale items, online codes, an ebate and then points to my debit card. I also love shopping with amazon gift cards earned through swagbucks! The best deals I've received have came from using coupon codes online! I am a fan of Souther Savers on Facebook. I am a fan of Ebates on Facebook. We saved 40 percent on our hotel room online, and received a 10 percent rebate on that from Ebates. I “like” Southern Savers and Ebates on Facebook. I like both on facebook!! I find clearance items, combine with ebates, rewards and coupons!! I love combining clearance and coupons. I like both ebates and southernsavers on facebook. I always look to see if the store is on e-bates and try to wait for a sale, or even better, free shipping on any order. always get great deals at Kroger! like SS and ebates on FB! My best tip for online shopping is shopping at Kohl's for the Black Friday deals. You can get most of the same sales online, without having to fight the crazy crowds. And if you do a quick search, you can also get a free shipping code! I liked Southern Savers and eBates Facebook. I like to buy gift cards at giftcard rescue and then combine savings by shopping through ebates!! I look for deals with free shipping! I got a great deal on a local fun place for the kids. I love to online shop and use the site RetailMeNot to find coupon codes for free shipping or % off purchases.Couple that with ebates offers and I get some sweet deals! My best tip is to not only check Amazon. I have like both of you!! i just stocked up on crayola markers for the year for 1.00! My tip for online shopping is to check the discount gift card sites before purchasing the online item. Sometimes there are “E-gift cards” and you can save an extra percentage with those in addition to ebates and coupon codes. I have always liked Southersavers and now I like Ebates on Facebook!! My best tip for online deals is to follow several “deal-finding blogs” like this one. Most of my sale purchases come from these sources, for online and in-store shopping. The best deals I have gotten were for diapers on Amazon.com. I used the subscribe and save and amazon mom membership to get 30% off, then I used 20% coupons I received in baby magazines that I got free for a year when I had my youngest son. I got these diapers for nearly nothing. I liked both Souther Savers and Ebates on FB. My online shopping tip is to look for shopping codes before I shop with online merchants. Also I check sites like Ebates and Upromise to see if I can earn money while spending money! Buy when sites have free shipping days! I follow ebates and ss on fb! My tip – whenever you are buying appliances, make sure you look on-line for all the codes and use a cashback site. We bought our washer and dryer on-line (from two different stores) and got over 50 bucks back from ebates! It's great to get cash back on little things, but don't forget what a big pay off you can get from buying BIG things on-line! I like Southern Savers and Ebates on facebook! I like SouthernSavers and Ebates! I recently got magazines via an ebates 26% cash back. Two years sub is $ 3 after ebates! I love SS and I love EB! I just got 3 Reynolds Wrap non stick for $.50 each using rainchecks!